Domenico Antonio DiNezza, son of Francesco DiNezza and Angela Mezzanotte, was born on Saturday, October 14, 1899, at Frosolone, Isernia Province, Molise, Italy. Domenico first married Josephine Mongello, daughter of James and Rose Mongello, on October 17, 1925, at Ashtabula, Ashtabula County, Ohio. He was widowed by the death of Josephine Mongello on October 27, 1956, at Painesville, Ohio. Domenico married second, Theresa Bowman Sziszak. He was widowed by the death of Theresa Bowman on March 7, 1964. Domenico married third, Maria (surmane unknown). Domenico died on February 26, 1977, at his home, 354 Sanford Street, Painesville, Lake County, Ohio, at age 77. His body was interred at St. Mary Cemetery at Painesville Township, Lake County, Ohio. Domenico Antonio DiNezza immigrated to the United States on March 20, 1914, at age 14, travelling to Painesville, Lake County, Ohio. 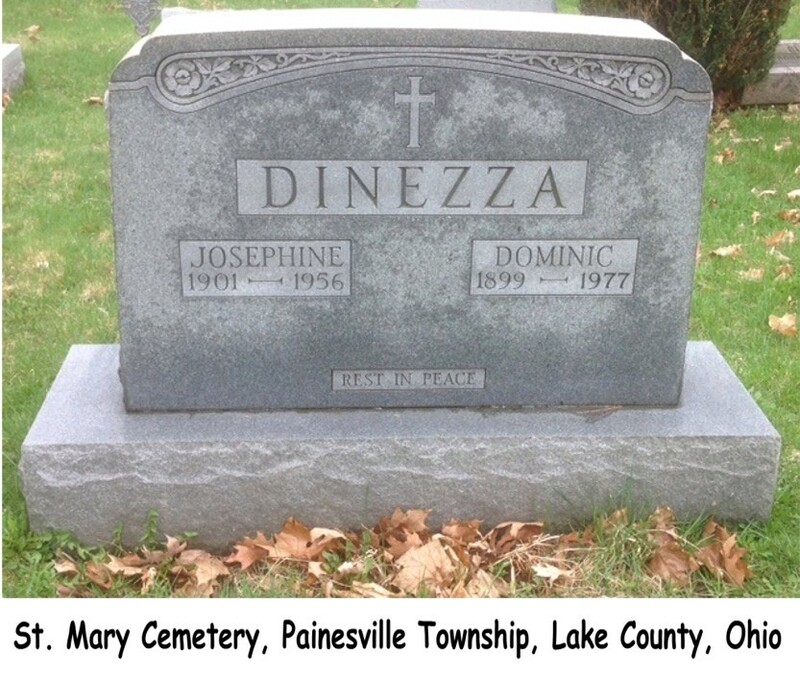 He was joining his father, Francesco DiNezza, in Painesville. Domenico DiNezza became a citizen of the United States on June 6, 1921. Domenico resided at Painesville Township, Lake County, Ohio, when he was naturalized. The 1920 and 1930 Federal Censuses indicate Domenico was working as a laborer for a nursery. He probably was employed by the Storrs and Harrison Nursery Company. 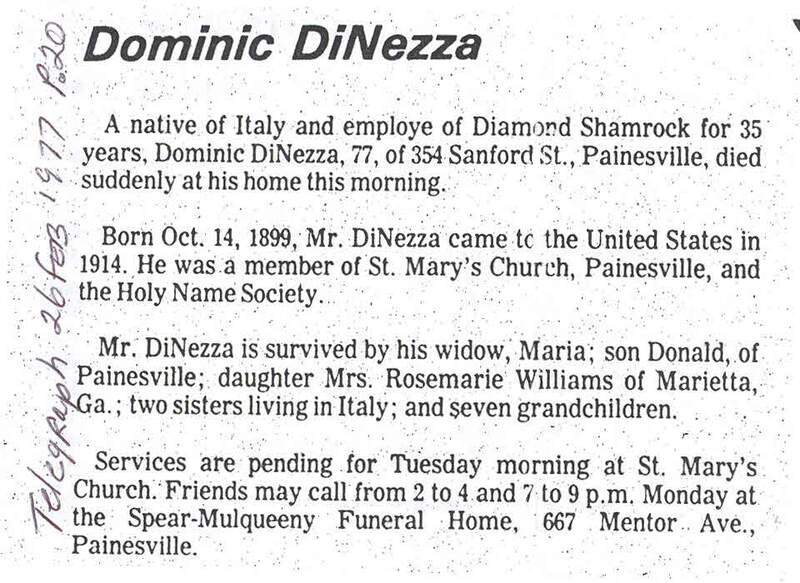 Mr. DiNezza was then employed by the Diamond Alkali Compnay for 35 years. 1. Donald DiNezza was born about 1927, at Ohio. 2. Rosemarie DiNezza was born about 1930, at Ohio. She married Robert Williams.